Breakfast kids cooking party for a buffet or brunch party. This breakfast kids cooking party can be turned into a buffet style brunch or breakfast party. We have several different recipes included in this party that you can add or choose how you'd like your breakfast kids cooking party to turn out. Create a recipe card for each child and for each recipe you are preparing. This will give them each a chance to follow the recipe while they are preparing the menu. It is also a good idea to include an extra one for them to take home, so they can impress their own family with what they learned at the cooking party. Once you know the number of children coming, go through the list of things needed especially utensils, bowls, etc. If you need extra, ask friends or family if you can borrow some items for your breakfast kids cooking party. Work together as a team and assign different tasks to each child so everyone has a turn adding or stirring. In a large bowl add flour, sugar, baking powder and salt. Set bowl aside. In mixing bowl blend together milk and egg. Add in dry ingredients from separate bowl and blend together in mixer. Blend in bananas and stir in chocolate chips. Prepare muffin pans with muffin liners or grease each muffin cup. Scoop muffin batter into each cup about ½ full. Bake for 25-30 minutes at 400 degrees. Test with a toothpick inserted in the middle. It should come out clean. Work together as a team and assign different tasks to each child so everyone has a turn adding or stirring. In small bowl add topping ingredients, brown sugar, pecans and cinnamon. Set aside. 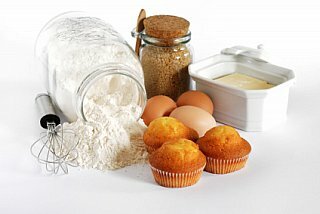 In mixing bowl add dry ingredients first including flour, sugar, baking powder, baking soda and salt. In separate bowl add egg, milk and oil. Blend together and add to dry ingredients. Blend until well combined but don't over blend. Prepare muffin pans with muffin liners or grease each muffin cup. Spoon batter into muffin tins about ¼ full. Sprinkle with pecan topping, spoon more batter on the top and sprinkle pecan topping again on the top. Bake at 400 degrees about 20 minutes until a toothpick inserted in center comes out clean. Have kids prepare a fruit salad with whatever fruit you have available. If they are old enough to cut with knives they can slice fruit also. Otherwise use soft fruits such as bananas, strawberries, grapes that they can add whole or use a non sharp knife to slice easily. For more breakfast recipes including a puff oven pancake recipe click here. Back to Kids Cooking Party from breakfast kids cooking party.